A prayer bead necklace is similar to a rosary, and is typically used in prayer or spiritual practice. You can make your own prayer bead necklace at home. Prayer beads are a very special item for someone of faith. Some are simply carried, while others are worn as necklaces. As a spiritual artifact, they carry great importance to the wearer. They may be worn during prayer, where the beads are counted as the prayer is spoken. Some people wear their prayer beads whenever they need to feel more of a connection to their deity. 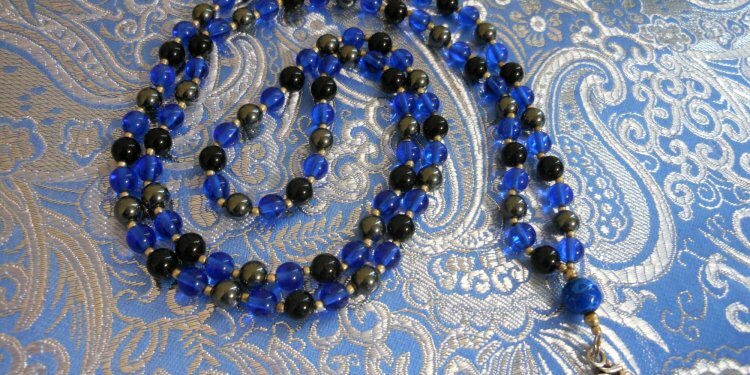 When selecting the beads for your prayer bead necklace, remember that prayer beads are typically strung in a repeating pattern, so you will need to have an equal number of each type or color of bead to maintain the symmetry of the pattern. Patterns can be as simple as two alternating colors, or far more complex. My first prayer bead necklace had sets of four alternating silver and black seed beads spaced with alternating black and red glass beads, with every other black bead having a silver cap. If you’re making a Japa Mala (Buddhist prayer beads) you’ll need to be sure to use 108 beads with one large central bead and no clasp. Refer to the instructions with an * below. When picking out your beads you not only need to think about what type of beads and what colors you want, you also need to think about what “feels” right for the piece. This is going to be a spiritual item, not a fashion accessory, so it needs to reflect your faith, not your sense of style. Also, don’t be surprised if what you thought you wanted and what you end up with are not the same thing. When I was making my prayer bead necklace I was planning on using blue beads (my favorite color) and a Celtic cross hanging from the middle. That is not how it ended up. I couldn’t seem to find enough blue beads, or ones that seemed to be right. The red beads just suddenly felt like the perfect thing for the necklace, and I was able to get exactly the right amount. (Later, I was able to get some amazing beads, as seen in the photo.) Go with whatever feels right, don’t worry about making it fit a specific mental vision. When you string your beads you can either make it long enough to slip over your head, or use fasteners. Mine has no clasp in the back, since it’s a Japa Mala. You can also make a plain strand, or add a dangle to the center like I did with mine. If you’re going to make a plain strand with no clasp, just tie one end of your quilting thread to a pencil (this keeps your beads from falling to the floor) and string on all your beads. When you have all the beads strung, return to the beginning of the strand and start going back through all of the beads to form a closed loop. I suggest going back through the beads one more time after that so you have 3 strands of thread inside the beads. This will make it very strong. When you’ve finished passing through the beads, take the thread off the pencil, tie the ends together in a few tight knots, then trim the ends and push them inside a bead to hide them. If you’re adding a clasp you’ll tie one end of the thread to one half of the clasp, then string the beads, and tie on to the other clasp. As before, pass the thread back through all the beads two more times for strength, then finish off. If you want a dangle in the center, you will have to count out your beads. * Tie onto your pencil or clasp and string half of your beads. Add one more bead to be the top of the dangle, then add the beads that will hang, and one more bead at the end. Pass your needle back through all of the dangle beads except the last one you added. This should create the dangle. Bring your needle out of the top of the dangle and string the other half of your beads, then restring and finish off as in the other examples. If you’re adding a pendant such as an Om or pentacle, the “last one” mentioned above will actually be the loop of the pendant. Once you have finished your necklace, it is best to cleanse it in whatever way you feel most comfortable with. I put mine out for a night under the full moon, but some people will use salt, holy water, ritual or other methods. Once your necklace is cleansed, keep it in a box of its own, separate from your other jewelry. Do not allow others to touch it if at all possible.